Algonquin Township Road District – Former Highway Commissioner Bob Miller – A walking conflict of interest. Oh look! a letter dated last week Friday, 20 days after Ed’s article, says the facts are different. Would you care to explain how Ed’s direct quoting of Rich Fahey is not a fact? Would you care to explain how Ed’s direct quoting of Derek Lee s not a fact? 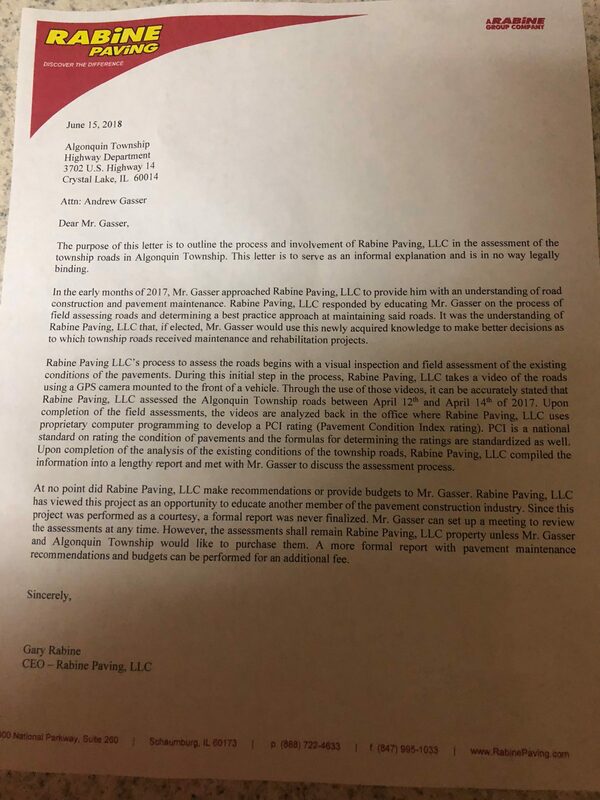 A conclusion that came about because Rabine did not respond to Ed, they could have responded to Ed with the exact same letter but they chose not to. So we have a reporter who published a story based on the information from and direct quotes of people directly involved being called a liar by people who lied about the existence of a report (IN RESPONSE TO A FOIA REQUEST, NONE THE LESS) and by a letter fabricated 20 days AFTER the article was published. hmmmmm… sounds like someone is trying to revise history to me. A quote is not a fact. It is a persons opinion. In order for it to be a fact it needs to have support. A proper reporting would not have drawn a conclusion from opinions. The document is NOT subject to FOIA. There was no lie about the report. Gasser DID NOT have a copy of that report. We saw reporting at the College of DuPage do the same thing. Report peoples words as fact without ever confirming those quotes to be accurate. Rabine aside, the paper trail that was in the public record PROVES he drew a conclusion that was in contradiction to the opinions he reported. Reporting a quote is reporting a fact, the fact in and of itself is the quote. it is factual that these people said these things, full stop. If I ask someone “why did you do this thing?” I can then report to others the FACT that they said why they did the thing. Without the full headers there is no proof they are emails to anyone outside the admins of the mail servers who can cross-reference the timestamps with the server logs. I submit this as PROOF that without full headers your documents I mentioned mean nothing. Then post the full hedder, I will admit I am wrong, I have done it before and I don’t pretend to know all. My point stands until proven otherwise, the PDF is missing crucial information. I made no accusation as to it being false or even if it is false that your group did it, I just pointed out that it is possible to fake. Also, I see you haven’t bought up the “quotes are not facts” will YOU admit I am right and concede that point? The content of the quote is not fact. Citing what a person says is nothing but reporting. Did he cite what the person said? Yes, but then he takes the same position as the quote without any validation of the content. Send me your email. I will forward you the exact email that is from Outlook. My source is 100% accurate that these emails are 100% accurate. I really don’t care if you want to believe it. Did make a claim to the content of the quote? No, I said the quote is a fact, it is a fact they said one of the reasons for joining the union was because of Rabine. Post the full headers publicly, if your right and I am wrong it will only help your position. Yes, they said what Ed said they said, and it was not true based on the facts! I don’t need any help with our position. Comming up on almost 24 hours andy post about your link not being the headers is still not visible…..
More then 24 hours now… still have not released my post from the moderation queue and still have not posted the full headers. Probably because public records obtained via FOIA are admissible in Court as authentic. Did you see the dropbox link yet? Yes I did see the Dropbox link, and the full hedder is not in your screenshot, a screenshot of the email open in outlook is not the headers. That’s all you are getting. Well then, I stand by my statement, your PDF is too easy to fake and proves nothing. If you actually had an email it would be easy to post the headers since you refuse… your proof is worthless, as is illustrated by my example PDF. To add to that; the fact that I requested the headers and you posted a screenshot as if that was what I was requesting, and then refused to post actually what I requested… doing makes me highly suspicious of any of your findings, and also makes me think that you just might know that what you have is not genuine. As I said before, public records obtained thru FOIA are admissible in court as authentic. Think what you want, we know what we have. …says Mike Tauler who has been caught with his pants down while talking about himself at meetings – yet dutifully reported on as news by Ed Komenda and the Northworst Herald. Tauler claimed to be an internet expert and said the the Highway Commissioner was incorrect on what C-Cleaner was. Ed Komenda and the Northworst Herald ran a story and then had to post on online retraction after it was discovered he was incorrect. However the damage was already done during the meeting. Ed Komenda is no reporter and Michael Tauler is nothing more than a troll. Yes says Mike Tauler who wet around to not only the Facebook groups but the NW Herald and McHenry country blog and owns his mistakes like a man. Unlike Gasser’s whining sniveling behind, who won’t even own up to one single mistake he makes, so much of being a righteous man of God with integrity. But hey! I put my real name with my options, so what is your excuse “Crystal Laker”. On a side note, I posted I a reply to Kurk on my lunch break, as of this post it’s not visible…. Everyone involved in this collusion have proved themselves to be corrupt if not outright criminal in their intentions. Why would anyone expect the local Ministry of Truth newspaper to do any legitimate reporting?